The Chinese word for fish (鱼/yu) sounds like the word abundance (余) that is why it is important for fish to be served as one of the dishes during Chinese New Year. You can use different fishes to cook and in different methods such as steaming, braising, deep-frying, you name it! In last year’s Chinese New Year series, I shared a Cantonese Style Steamed Fish (粤式蒸鱼), so I thought it will be nice to share a different method of cooking the fish this year. When I was approached by Share Food to create a dish using Maggi products, I was unsure of what ingredients to use. As I have a bottle of Maggi extra spicy chilli sauce on hand, I thought it would be a great idea to cook with it. My family was impressed by the taste of the sauce I have created and poured over this deep fried fish. Needless to say, they enjoyed this dish thoroughly. So why not add this on your list of dishes to cook this Chinese New Year! 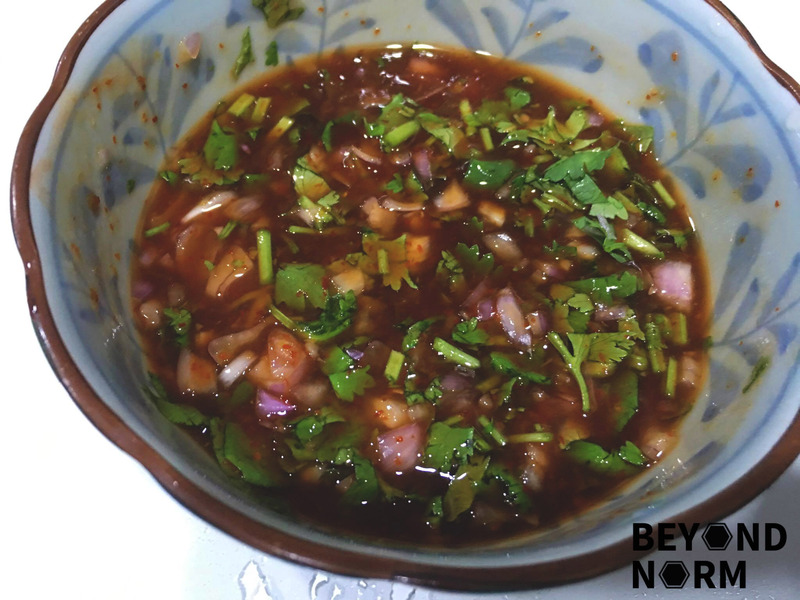 Let’s get cooking…..
Another dish created by Mummy’s Kitchen for your enjoyment. If you like this dish and want more cooking ideas, we love to hear from you either via our blog or by joining our Mummy’s Kitchen Facebook Group. You can also like us on Beyond Norm’s Facebook Page or subscribe to our blog via the right side bar to get the latest updates. 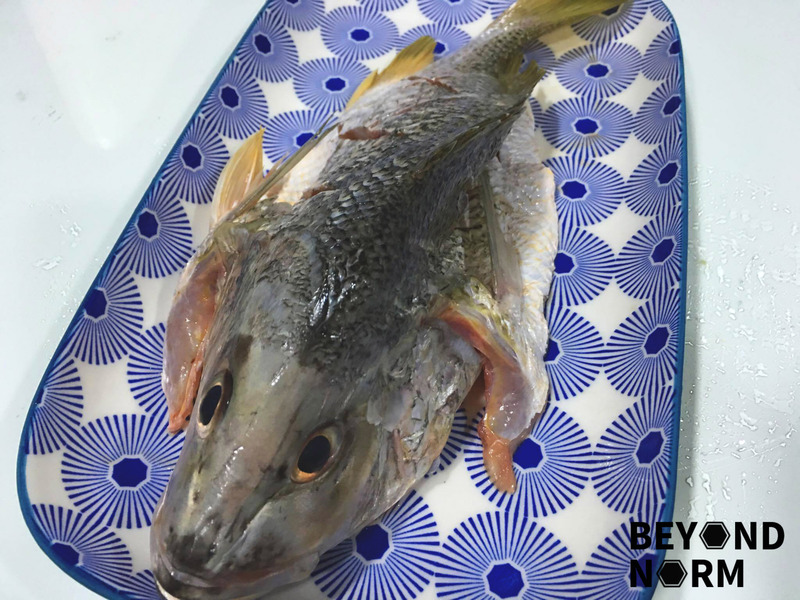 If your fishmonger has not done it yet, “Butterfly” the fish by splitting the fish using a sharp knife. Clean, wash and pat the fish dry. Make 2 diagonal cuts on each side of the fish to ease cooking. Coat the fish in a thin layer of flour on both sides, inside of meat and outside of skin. In a large pan, add the oil and heat for 5 minutes until hot, but not smoking. Hold the tail of the fish and slide the fish into the hot oil from the side of the pan. Deep fry fish on medium heat until crispy and golden brown (about 5 minutes on each side). When done, set the fish aside. Mix all the ingredients, except the water, into a small bowl. 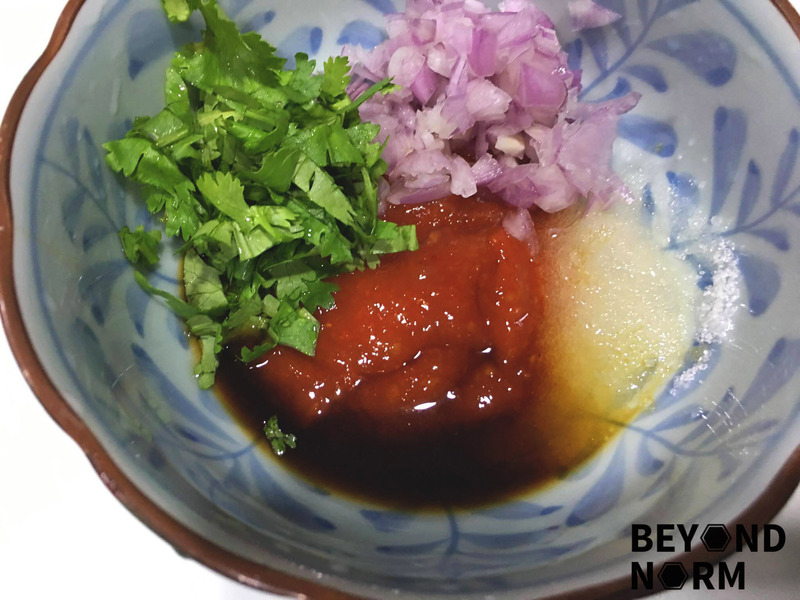 If the sauce is too thick add a few drops of boiled water to dilute. Line a serving plate with the shredded cucumber. Place the fried fish on top. Garnish with thin lime slices (Optional) and serve immediately.